Western Australia will soon be the world-leader in the geo-sequestration of carbon dioxide. Both the Gorgon project and the South West CCS Hub will store several million tonnes per annum of carbon dioxide in saline aquifers. Two of the most important but least understood mechanisms by which carbon dioxide remains trapped in these aquifers are known as residual trapping and solution trapping. Residual trapping relies on capillary forces to immobilize carbon dioxide “droplets” within the porous rock containing the aquifer. 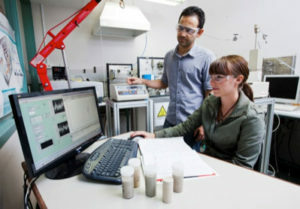 Research in the Fluid Sciences and Resources Laboratory is conducted to enable better prediction of the extent of these two trapping mechanisms exploiting simple NMR characterization of rock cores extracted from suitable reservoirs. Western Australia has several major offshore gas assets containing significant quantities of carbon dioxide. Scenarios for dealing with this carbon dioxide must be developed before these gas fields can be developed. One scenario involves the re-injection of carbon dioxide produced from one reservoir into the extremities of a different natural reservoir for the purpose of both carbon dioxide disposal and enhanced gas recovery. However, such a strategy is only viable if the probability of breakthrough by the re-injected carbon dioxide to the producing wells is small and the contaminated gas mixing zone remains small over the life of the asset. Simulating reliably this novel reservoir production scenario requires an improvement in our fundamental understanding of the hydrodynamic behaviour of supercritical CO2 in heterogeneous gas and water-saturated rock. Our laboratory conducts carbon dioxide core-flooding experiments, which provide key input parameters for the field-scale simulations of enhanced gas recovery we are undertaking. The data and models are used to determine the dispersion of carbon dioxide as a function of pressure, temperature, rock heterogeneity and saturation.